Cambridge has a long history of bookselling, stretching back well before the advent of printing into the mists of medieval time. Books were first printed here in 1521, through the enterprise of John Siberch (who stayed only a couple of years), and we know the names of numerous stationers and bookbinders from the period, including Nicholas Spierinck and Garrett Godfrey. Many booksellers had connections to the University Library: in the seventeenth century local booksellers were used to make lists of the vast collection of Richard Holdsworth (which arrived at the Library in 1664) and the eighteenth century gave us John Nicholson (known as ‘Maps’), whose larger than life-size portrait hangs on the staircase up from the Library’s Entrance Hall. The nineteenth century saw the coming of booksellers who would continue trading well into our own day, including Heffer’s in Trinity Street (celebrating its 140th anniversary and now part of the Blackwell chain) and Galloway & Porter in Sidney Street (which closed in 2010 after more than a century of trading). Today things are rather different, with G. David the only one of the long-established Cambridge shops still trading independently (and, it must be said, with virtually no reliance on the Internet for sales). 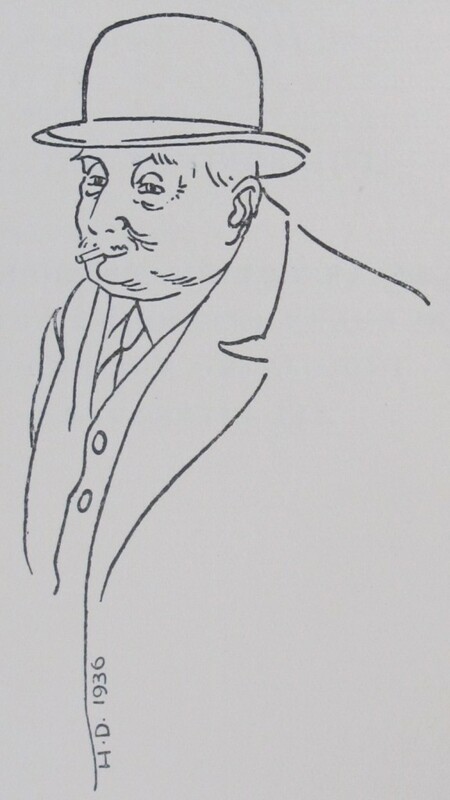 The story begins in 1860 with the birth in Paris of Gustave David who, after an education in Switzerland, moved with his family to Gorleston in Norfolk to establish a bookshop. He later moved to London, but in 1896 decided to migrate to Cambridge where he remained for forty years – selling books in the marketplace – until his death on 20 November 1936, eighty years ago today. The business, long based in St Edward’s Passage near the Arts Theatre, continued under his son Hubert (1900-1990) – an accomplished designer of bookplates – and is now managed by a small team including Hubert’s grandson David Asplin. There is an extensive antiquarian section with good holdings in early science, travel, botany, classics and of course Cambridge, and an ever-changing stock of second-hand and remaindered books on all subjects. It supplied the Library with rare books for many years (both directly through purchase, and indirectly through the gifts and bequests of Cambridge collectors over the years), though this tradition seems to have lapsed. Although there are probably thousands of books in the Library bought from David’s, most are difficult to find in the catalogue, since it has only been common practice to include provenance and sources of acquisition in records for the last couple of decades. 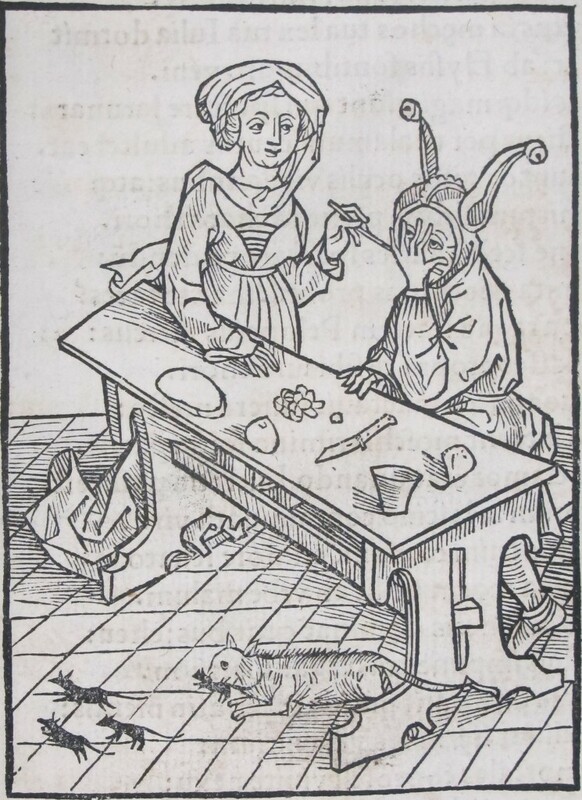 Consequently, only those individual books or whole collections which have recently been recatalogued (notably the incunabula, recatalogued as part of a five-year project which ended in 2014) will provide information about acquisitions. 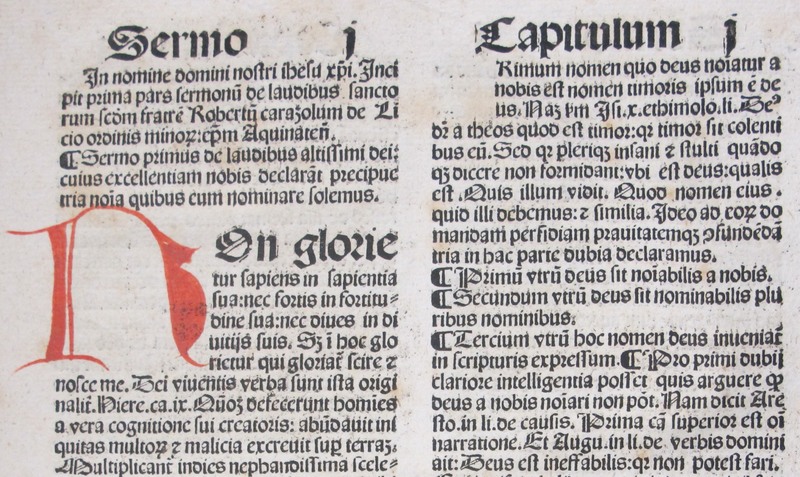 What follows is based primarily, therefore, on the Library’s incunabula, at least ninety of which were bought directly from David’s before c. 1950. One of the Library’s first acquisitions from G. David, then based in Cambridge marketplace, was a Venetian edition (1498) of the letters of Franciscus Philelphus (ISTC ip00599000). Four other copies are recorded in the UK (though it is not in the BL) and it cost 8 shillings in May 1897, the year after G. David set up business. Towards the end of his life the Library purchased Johann Reuchlin’s Vocabularius, printed in Strasbourg in 1491 (ISTC ir00167500). 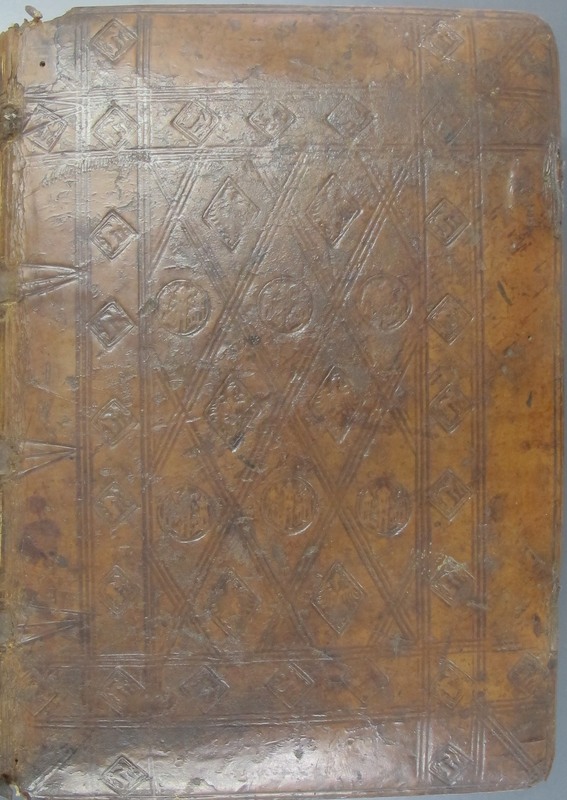 A good example of England’s connections with the continental book trade at the time, it soon made its way to London, where it was bound not long after (see above); it retains its blind-tooled brown calf over wooden boards, with parchment fragments from an early fourteenth-century manuscript used as pastedowns. Soon after 1500 it belonged to one John Warner, who inscribed one of the blank endleaves ‘John Warner at the sygne of the hose in Chepesyde’ (see above) followed by a list of fees paid to various people. It contains other sixteenth- and seventeenth-century inscriptions, and eventually appeared in a London auction (Hodgson’s, lot 607) on 23 March 1933, where it was bought by G. David and later sold to the Library. It remains rare, with three other copies in the UK (not in the BL). In February 1931 the Library purchased from G. David the Sermones of Robertus Caracciolus (Augsburg, 1490; ISTC ic00147000), which had in the seventeenth century been in the library of the Franciscan convent at Bolzano (South Tyrol, Italy), also known during its German past as Bozen. The funds for the purchase came from the University’s Baskerville Club, founded in 1903 by Charles Sayle, for ‘the encouragement of bibliographical studies by publications and otherwise’. Among its members were several Library staff (including A. T. Bartholomew, and University Librarian Francis Jenkinson), along with John Maynard Keynes and Stephen Gaselee. It flourished, publishing a number of bibliographical works in the first two decades of the century. But, after the death of Jenkinson (its first President) in 1923 and that of Sayle himself in 1924, the Club met less frequently and by the late 1920s it was clear that it was struggling. In 1927 it was decided that the Club should be dissolved and in 1931 all remaining funds (£61 17s 6d) were passed to the Librarian A. F. Scholfield ‘to be put at his discretion to any purpose which comes within the scope of the Club’s activities’. Book purchases would certainly have come within these terms, and there must be other books now in the Library’s collections acquired through the generosity of the Club. The passage relating to the invention of printing is of great importance and … ought to be proof … that Mayenne [Mainz] has the honour of the invention. All that is known of the block books us of so uncertain a character that it is almost impossible to found a sound theory in favour of Haarlem or any other place. Block Books are books printed entirely from woodblocks around the same time that Gutenberg invented printing with metal type, but were long thought to be the ‘missing link’ between manuscript and print. The issue of Haarlem being the site of the invention of printing comes from a long-believed story that someone by the name of Laurens Coster (of whom there is a fine statue in Haarlem’s main square) invented printing from moveable type in the Dutch town, and that Johann Fust (Gutenberg’s partner) stole the idea and took it to Mainz. Gutenberg’s early books bore no dates or locations of printing (the first dated book is 1457) so for many years people tried to prove that Haarlem had got there first. Another of the Library’s incunabula (a Dutch books of hours bought in 1891), undated but printed in Haarlem in 1480, contains a wholly fabricated colophon added in the eighteenth century, giving Coster as the printer in the year 1450. It is evidence of the importance of proving the origins of printing, arguments around which raged well into the nineteenth century. G. David will, in 2021 (incidentally, the 500th anniversary of printing in Cambridge), celebrate its 125th anniversary and we hope they will continue supplying fine books to greedy collectors for many years to come.